Bristol Street Motors has completed its £600,000 relocation and refurbishment of its Hyundai showroom in Exeter, reports CarDealer magazine. The latest refurbishment by Bristol Street Motors, which is part of the Vertu Motors car dealership network, marks another investment in its state-of-the-art UK showrooms tailored towards providing customers with a comfortable and relaxed buying experience. Customer service has become more and more important for car dealers across the UK, as increased competition from online vendors has eaten into the dealership market. Offering extras such as aftersales servicing and test drives are even more vital than ever. So, in addition to general motor trade insurance and road risks insurance, dealers should consider demonstration insurance too, to ensure they are covered for test drives whenever they are requested. As part of the move from Marsh Barton Trading Estate to the new facilities on Trusham Road in Exeter, the team has expanded to provide a better customer experience. 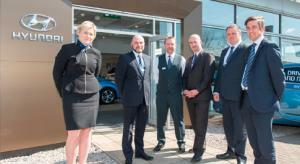 The new site also offers customers of Bristol Street Motors Hyundai Exeter a luxurious showroom, as well as ground and first-floor offices with plush furniture and state-of-the-art lighting throughout. The new dealership also offers a refurbished workshop area for servicing and aftersales. The huge investment in the facilities offered on-site has also enabled the car dealership group to open a Van Centre adjacent to the main showroom, with increased car parking space for customers. Oliver Follows, the branch manager at Bristol Street Motors Hyundai Exeter, said of the investment: “Since moving into the new site, we have received an overwhelming response from both new and returning customers.